Photographic reproduction of buildings and artworks permanently placed in public places must be in accordance with good practice, must not conflict with the normal exploitation of the work and not prejudice the author or right holders. However, these provitions do not apply when the image of the work is the main subject of such reproduction and / or the reproduction is used for commercial purposes. The heirs of Anca Petrescu, the architect of the colossal building in Bucharest, known during the communism as the House of the Republic or the People's House (currently named the "Palace of the Parliament", because it is the seat of the Parliament of Romania), sued the Chamber of Deputies (Inferior Chamber of the Romanian Parliament) for using the image of the iconic building without authorization, according to ProTV. In addition to the copyright infringement, the heirs also claim the alleged infringement of other intellectual property rights, as the architect Anca Petrescu registered during her life several trademarks depicting the Palace of the Parliament from different angles. "Anyone using the image with the Palace of the Parliament must ask for our authorization and pay us a fee of two percent as consideration for our intelectural property rights" said Cristina Petrescu, the architect's daughter for ProTV. "The image of a building [ie. Palace of the Parliament] for which Romanians have contributed for years does not belong to the Romanian State, but to a natural person and to her heirs, because the Romanian State has failed to solve this problem for years. If you want to take a photo with the Romanian Parliament building, then the heirs of the ahitect sue you for intelectual property rights infringement. [...] We are the only Parliament in Europe or maybe in the entire World that can not sell suvenirs because of this intellectual property issue" said Valeriu Zgonea in 2016 for dcnews. There are many causes which originate before the Romanian Revolution in 1989 (eg. absence of a written contract addressing these matters between the architect of House of the Republic and the Romanian State - the beneficiary of the work), but there are also errors of the Romanian politicians after the Revolution, because they have not understood the importance of the "Freedom of Panorama". The concept of the "Freedom of Panorama" derives from the German word Panoramafreiheit and it is a limitation of copyright allowing for e.g making and sharing photos / videos, or other works (drawings, paintings, etc.) of buildings, sculptures or other works of art, permanently placed in public space and for which the author has already been remunerated from public funds. The "Freedom of Panorama" has been inconsistently implemented in the national jurisdiction of EU Member States as a result of Directive 2001/29/ EC (the InfoSoc Directive) which allowed the Member States to introduce or not exceptions or limitations from copyright in this respect (Article 5 (3) (h) of the InfoSoc Directive). While Germany and UK allow the incorporation of such works in panoramas without any restrictions, other Member States allow only non-commercial purposes and/or when the works is not the main subject of panorama. Unfortunately, the new EU copyright reform does not address this inconsistence between national jurisdictions in EU. In Romania, according to article. 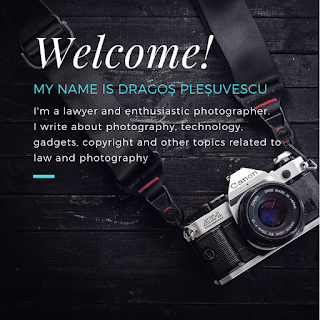 35 (1) of Law 8/1996 on copyright and related rights (Republication, 2018) "It is allowed, without the author's authorization and with no fee to be due, the following uses of a work, previously made available to the public, provided that they comply with good practice, do not conflict with the normal exploitation of the work and do not harm the author or its copyright holders: ... (f) reproduction, excluding any means directly related to the work, distribution or communication to public of a image of a arhitectural works, plastic, photographic or applied art, permanently located in public places, except where the image of the work is the main subject of such reproduction, distribution or communication and it is used for commercial purposes". According to the Law 8/1996, a commercial purpose is when there is a direct or indirect economic or commercial advantage (Article 193 (7) of Law No 8/1996). It's easy to notice that this definition is quite broad and greatly reduces the scope of use to that extent a simple image upload in the social media (even by a natural person) can be seen as an economic advantage (eg. pursuing to obtain promoting, generating traffic, monetizing, etc.). In conclusion, the Romanian lawmaker opted to exclude from the "Freedom of Panorama" the situations in which the image of a work is the main subject (which is the case at hand it's quite imposible to met given the colossal Palace of the Parliament) AND/OR (?) the panorama is used for commercial purposes. The irony makes this regulation turned back against the Romanian lawmaker (ie. Chamber of Deputies) in its trials with the heirs of the arhitect. 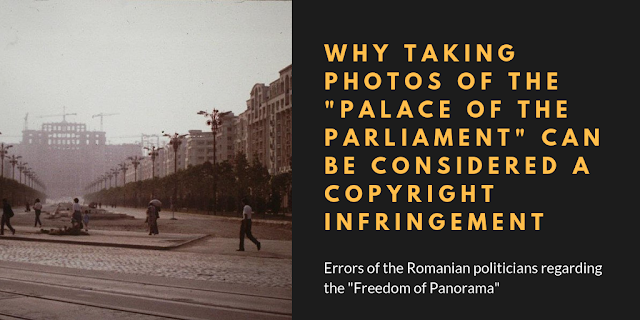 Whatever the outcome of the trials would be, the copyright law uncertainty and the need to have real "Freedom of Panorama" in Romania remain. If you have additional information or have a different opinion regarding this article, feel free to use the comments form below.